The developing choir is a unique ensemble and ranges in size from many to just a few, in age from younger to older and from the experienced to brand new singers. Both male and female are a part of these groups with ever-changing vocal challenges. Educators who teach this wide group of musicians know there is a need for many tools of repertoire that build bridges to the art of choral singing. 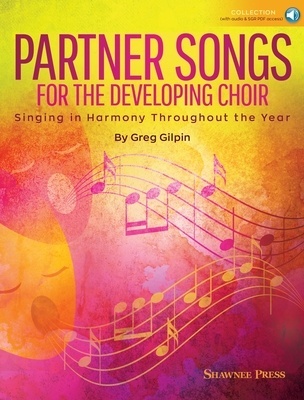 “Partner Songs for the Developing Choir” is designed to help teach harmonic singing through sophisticated melodies and distinguished texts, appealing to singers from upper elementary through middle school and early high school, and can even continue for the less-experienced or smaller adult choir. Some of the choral works are very basic in form and melodic writing, while others might include a bridge or “B” section or more intricate melodies, expanding the harmonic learning. This REPRODUCIBLE collection with helpful rehearsal suggestions and online access to Full Performance and Accompaniment Only audio recordings and Singer PDF parts can be used all year long with spirituals, Latin settings, multicultural, patriotic, Christmas and holiday selections. Songs include: Akatonbo, Bethlehem Lullaby, Et in Terra Pax, Jingle All the Way, Joshua Fit the Battle, Keep Your Lamps Trimmed and Burning, Musica Dei, Skatin' and Sleighin', Swing Low Sweet Chariot, You're a Grand Old Flag. Suggested for Grades 3-9.